NEW YORK — The Arizona Diamondback rattled Noah Syndergaard with four more stolen bases, then broke open the game in a six-run sixth inning that included Chris Owings’ bases-loaded triple and rolled to a 9-0 rout on Thursday to complete a three-game sweep of the Mets. The Diamondbacks were a band on the run with 13 stolen bases in the series — one shy of Baltimore’s season total. "We’ve been on defense when other teams do it. You just start to get frustrated," said Paul Goldschmidt, who reached base five times and swiped second and third in the fifth inning. Braden Shipley (2-1), making his fourth big league start, pitched three-hit ball over seven innings, struck out seven and walked one. Zack Godley and Dominic Leone finished the five-hitter. Arizona set a franchise record for steals in a series, topping its 10 in a four-game set against Miami in 2009. In the fourth inning, Socrates Brito swiped third and Shipley later stole second without a throw. "Maybe not the smartest decision sliding headfirst," Shipley said. "It was just kind of instinctual for me." Runners have swiped 36 bases in 40 tries against Syndergaard this year and are 51 for 56 against him in his career, according to the Elias Sports Bureau. The Mets have allowed a big league-high 102 steals, including 20 off rookie Steven Matz, who is second behind Syndergaard. "It’s real easy for the baserunners to predict when I’m going to home and when I’m going to able to pick off. It’s really mechanical," Syndergaard said. 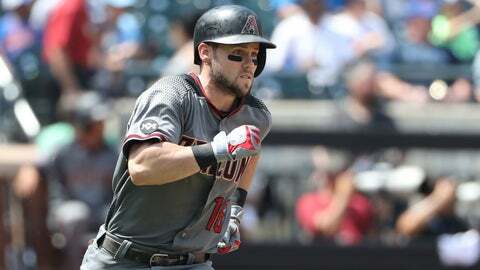 After brushing aside Syndergaard (9-7) on the humid, 93-degree afternoon, the Diamondbacks began their burst against Jon Niese with a leadoff homer by Tuffy Gosewisch, who had tripled in a run an inning earlier. Owings singled, doubled and tripled for his second straight three-hit game. Arizona has won four straight following an 8-26 slide. With its first sweep at the Mets since 2002 in Shea Stadium, the Diamondbacks improved to 29-27 on the road; they are 19-39 at home, where their retractable roof is usually closed. "Some of the ballparks bode better for them," Arizona manager Chip Hale said of his pitchers. "The weather, the humidity helps the guys’ balls move. But we have to do better. This is something that’s not going to be acceptable for us. We have to play better at home." New York, which began the day 2 1/2 games back for the NL’s second wild card, dropped to 10-16 since the All-Star Game and at 57-57 is down to .500 for the first time since a 7-7 mark in April. Fourteen of New York’s last 15 batters made out, and the Mets — missing injured Yoenis Cespedes, Lucas Duda, David Wright and Jose Reyes — managed five runs and 17 hits in the series. They have the lowest batting average in the major leagues and were shut out for the ninth time. Syndergaard allowed three runs and eight hits — including three doubles and a triple, dropping to 0-4 in his last six starts. Brito’s opposite-field double to left, Gosewisch’s opposite-field triple to right and Shipley’s RBI single — all over or through a drawn-in infield — built a 3-0 lead. Manager Terry Collins held a team meeting after the game. "Kind of allowed us to click the refresh button," Syndergaard said. Shipley joined Arizona’s Zack Greinke and San Diego’s Edwin Jackson as the only pitchers with stolen bases in the major leagues this season. Shipley is the second Diamondbacks pitcher with an RBI and steal in the same game, joining Joe Saunders against Houston on Sept. 4, 2010. Arizona had the most steals for a team in any series since Texas swiped 13 over three games at the Los Angeles Angels from Aug. 5-7, 2013. Diamondbacks: Dr. Don Sheridan, the Diamondbacks orthopedic hand specialist, operated Thursday to stabilize a tendon in the left wrist of OF David Peralta, who crashed into the outfield wall in Arizona on Aug. 5. Hale said Peralta should be ready to start spring training. … LHP Andrew Chafin (shoulder tendinitis) pitched a hitless inning for Class A Visalia on Wednesday night and could return to the Diamondbacks for Monday’s homestand opener against the Mets. … OF Yasmany Tomas (neck) missed the entire series. Diamondbacks: Patrick Corbin (4-11) is to start at Fenway Park, where David Price (9-8) will be on the mound for Boston.